Looking for a Used Flying Spur in your area? CarGurus has 180 nationwide Flying Spur listings starting at $82,995. Bentley continues to break with an ultra-luxe tradition and delivers a driver's 4-door for 2014 in the second-generation debut of its Flying Spur. No longer impenetrably balanced, this Flying Spur is compliantly suspended and built to be the fastest and most powerful Bentley saloon ever. Moreover, absolutely everything is redesigned except for some handles, sun visors and arm rests, shedding just enough of that old world to be modernly charming with a succulent but commanding presence. The 2014 Flying Spur's new skin differs subtly, alluding to its 64 hp and 111 lb-ft/torque gain with sweeping muscular definition. The renewed bonnet and belt especially evoke a sense of brawny driven grace, no longer the right-angled trapezoid of an esteemed chauffeur. The cabin is just as updated, with a major technology infusion adding twin 10-inch LCD screens for rear entertainment, a detachable touchscreen remote, its own Wi-Fi hotspot and massaging, heated and cooled front seats to complement its driver-oriented redesign of every interior control. Every suspension component has been softened, every body join quieted and strengthened. Acoustic glass and paneling with improved seals reduce the outside world's intrusions inside the cabin by a claimed 40%, but the suspension tweaks mean passengers will feel maneuvers much more than in the previous model. The drivetrain is the same all-wheel drive with rear-wheel power proportions defaulting to a 40/60 power split, and 4 drive modes offer everything from a limousine feel to something akin to its former sporting dynamics, but even that sport setting is nevertheless noticeably less agile under pressure than past versions. Still a sneaky accelerator, this Flying Spur achieves that classic 0-to-60-mph benchmark 0.6 seconds quicker than its predecessor for an impressively effortless 4.3-second sprint up to highway speed with its new 8-speed ZF shiftable automatic transmission. Between engine tweaks enabling its W12 to put out the same 616 hp and 590 lb-ft of torque as the current Conti GT Speed, plus that new transmission and a 112-pound drop in weight, this Flying Spur is estimated to get 12 miles per premium gallon in the city and 20 highway, as opposed to the previous 11/19. Four- and 5-seat configurations are available for 2014, with Bentley's iconic glass roof offered as a no-cost option. New color options include Dark Cashmere and the coveted Damson interior and exterior treatment inspired by the rare purple diamond. New 19-inch wheel options include bright colors and diamond-turned finishes to round out its 17 standard colors, though typical of Bentley anything is possible if you can write a check big enough. As for those spy shots with twin mobius tailpipes on a Flying Spur indicative of Bentley's V8 engine—mum's the word. Bentley isn't telling any tales as to whether we can look forward to a more fuel-efficient Flying Spur, but I wouldn't count out that possibility just yet. This maker has a habit of pulling engine rabbits out of similar-model hats and might be saving that particular gift until after its lineup's style and tech revitalization. There's a promised “performance variant” beyond the new-for-2014 Continental GTC Speed already in the pipe so far, and this redesign means that can't be far off now. 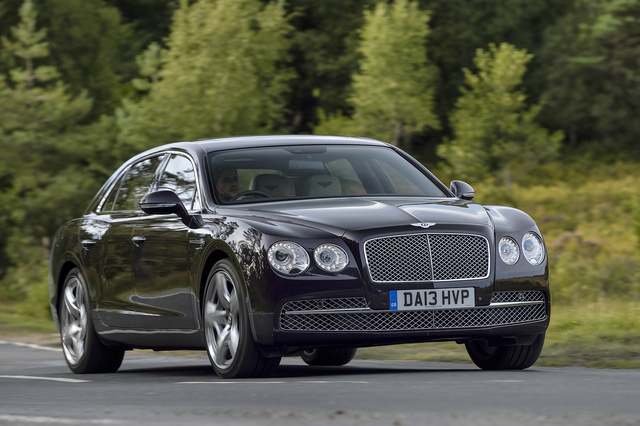 What's your take on the 2014 Bentley Flying Spur? 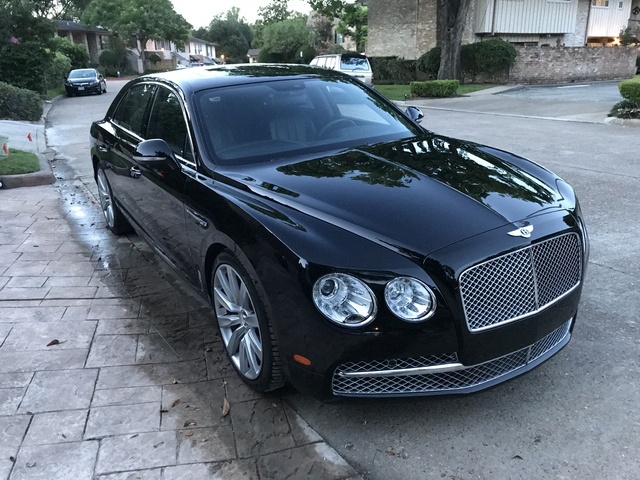 Have you driven a 2014 Bentley Flying Spur?